Now that we're at the midseason point, it's time to look back at the top sneaker highlights and flash forward to the fireworks at All-Star Weekend. NBA All-Star Weekend is like Christmas for the sneaker industry. It's a time when major brands showcase some of their best offerings to consumers. Other than the Super Bowl, there is no other event that can compare to the versatile star power that All-Star provides—meshing some of the biggest athletes, entertainers and influencers in one setting calls for great events and activations throughout the weekend. Adidas has a stacked lineup performing at their 747 Warehouse event that includes 21 Savage, French Montana, Lil Uzi Vert, N.E.R.D. and Pusha T. The brand will release a bunch of exclusive kicks on the site. NBA Future Power Rankings: Which Bad Teams Have the Brightest Future? Nike has an event called "Makers of the Game" that will include exclusive product drops, a Kobe Bryant conversation, a Pigalle basketball tournament featuring Giannis Antetokounmpo and a performance by Kendrick Lamar. And Jordan Brand will be holding a block party in the City of Angels featuring many special guests. Now that we've reached the midseason point, it's time to look back on the top sneaker highlights from this NBA season and get a glimpse of what is releasing during All-Star. The LeBron Watch program is one of the most creative sneaker release activations in recent years. The program consists of LeBron unveiling a special player edition silhouette that pays homage to iconic athletes and Nike shoes that have inspired his career. Some of the sneakers he has played in so far have been inspired by Deion Sanders and the Nike Waffle trainer. Sadly, most of the sneakers are just for him, but he will also release five of the PEs to Nike members via the Nike SNKRS app as soon as he steps on the floor wearing them. The plan is brilliant. How many times have you looked at a players shoe and said you wanted to buy what wasn't available? We see brands go over the top on certain sneaker releases—probably too over the top—but this feels organic since consumers are getting the opportunity to put themselves in LeBron’s sneakers instantly. If the LeBron Watch program wasn’t enough, Nike and Ronnie Fieg of KITH collaborated on the ‘Long Live the King’ collection. A partnership that adds a luxurious feel to Bron’s sneakers, chapter 2 of the collab features a royal theme throughout each silhouette, as a pattern inspired by kings’ cloaks is included. The four models consists of the two performance models, the LeBron XV “King’s Cloak” and the all-black “Suit of Armor”. The two XV lifestyle models includes the “King’s Crown” and the all-white “City of Angels”. The collection will be sold on Friday, February 16, exclusively at the new KITH Los Angeles store. When it comes to signature sneakers, there are always weak links in the bunch. 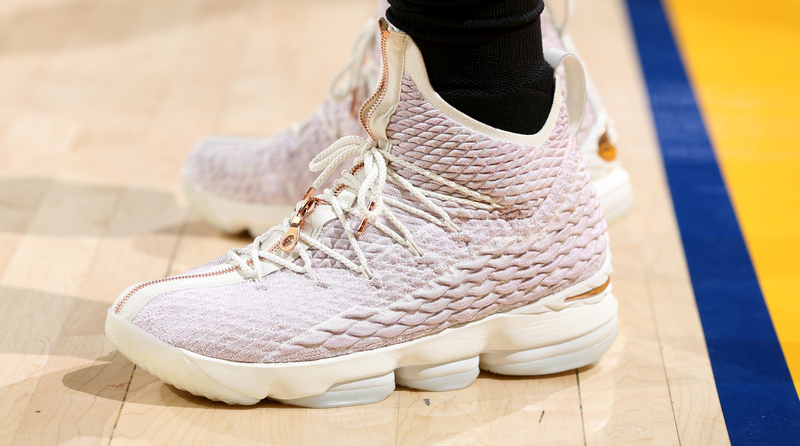 Even LeBron said he missed the mark a couple times the past few years before hitting a homerun with the LeBron 15. Stephen Curry was ridiculed for just about every signature he has released, but the criticism has died down a bit with the Curry 4—a sneaker The Crossover discussed with the man himself earlier this season. Paul George became a signature sneaker star after the release of the PG 1 and following up was destined to be a tough task. The PG 2 might not look better than the PG 1 aesthetically but it is still an incredible follow-up. PG obviously gets it when it comes to working on a signature sneaker and skipped the sophomore slump. The Playstation collab was a solid intro. Fellow Nike signature star, Kyrie Irving is already on his fourth signature model and usually goes outside the box with his sneakers. He seeks inspiration from everywhere, including his love of skateboarding and music. You can always expect Irving and Nike to deliver on colorways. This year we saw Kyrie pay homage to the classic Nike SB Dunk colorway “The Yellow Lobster” and a great Chinese New Year edition Kyrie 4. James Harden’s first signature sneaker, like the PG 1, was met with great reviews and Vol. 2 is certainly looking like a good follow-up. The shift in design drew critics at first, but performance-wise the Harden Vol. 2 might be one of the best sneakers released this year. It features a full-length BOOST that is designed with a wide base at the back of the foot to create stance and provide a balanced platform for Harden’s versatile footwork. Russell Westbrook is without a doubt the fashion king and the only thing he was missing was a performance signature sneaker. Westbrook spent the past few years as the leading model for every flagship Air Jordan signature since the Air Jordan XX8, but with his star rising higher and higher after an historic MVP campaign, the brand did the right thing and gave Westbrook his own thing. The Jordan Why Not Zer0.1 plays into Westbrook’s mantra and surprisingly stays grounded—unlike his fashion choices. Kobe Bryant endured one of the greatest sneaker free agencies ever before signing with Nike. After wearing various models such as Air Jordans and Nike Air Huaraches, the Swoosh gifted Bryant his first signature sneaker, the Zoom Kobe 1 in 2005, and he wore the shoe when he scored 81 against the Raptors and in 2018 Bryant revealed that the sneaker will make its return as the Zoom Kobe 1 “Protro”. The sneaker will look exactly the same as the original but will include the latest Nike tech to reduce weight and increase performance. Michael Jordan’s birthday has become part of NBA All-Star weekend—a showcase he helped build to what it is now. Every year on February 17th you can expect the Jordan Brand to release notable sneakers for the GOAT’s birthday. But this year, the brand is going all out. The product offerings include the 30-year anniversary of perhaps the most iconic sneaker ever with the Air Jordan III “Black Cement”, the Air Jordan III “Free-Throw line” and of course the Drake collab White OVO Air Jordan VIII and the Black OVO Air Jordan VIII. Look at how far sneakers in the NBA have come! The NBA has gone through a mini-Hypebeast revolution in which we saw numerous players wearing Virgil Abloh’s Off-White X Nike collection. For All-Star the collabs do not stop. Damian Lillard is dropping three new colorways of his Dame 4 sneakers in collaboration with iconic Japanese streetwear brand A Bathing Ape, also known as BAPE. Nike partnered with numerous athletes and collaborators to launch their All-Star products called Makers of the Game. In celebration of the ASW in Los Angeles, every All-Star sneaker is inspired by communities in the L.A. area. The Kyrie 4 All-Star takes inspiration from Venice and features a tie-dye graphic print. The KD X All-Star takes inspiration from Santa Monica with a multi-color knitted upper that signifies the sunset on the Santa Monica Pier. The PG 2 All-Star pays homage to Paul George’s hometown of Palmade. The colors represent the various aspects of the Inland Empire. The gray represents the desert and dust of Palmdale, while the orange is meant to highlight the sunset on the horizon, according to Nike. The pop of green is a nod to the nature around this area. Lastly, the sockliner features a custom graphic of Palmdale, and a grit out and midsole highlight the city’s terrain. The LeBron 15 “Hollywood”, which will be LeBron’s All-Star sneaker, will not be released with the bunch but has a March release date. Russell Westbrook stays close with the Jordan Brand's black and white uniform theme with his signature sneaker. James Harden’s All-Star sneaker pays tribute to Audubon Middle School, the school he attended in Los Angeles. Using Audubon’s school colors, Harden's "Vision" sneaker is designed in varying shades of green with a unique palm tree glitch pattern on the lacing system and bootie. A colorway "Vision" traz tons de verde, em homenagem à escola em que James Harden fez o seu ensino fundamental, a Audubon, em LA. Stephen Curry and Under Armour take the clean route with the Curry 4 All-Star. The sneaker features an all-white palette that was inspired by the City of Angels.